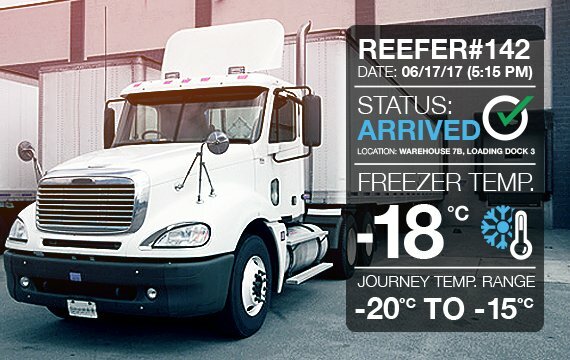 Businesses transporting perishable food products are required to accurately monitor the temperature of the goods in transit so as to be compliant with Canadian Regulations and the FDA’s Food Safety Modernization Act (FSMA) for transportation between Canada and the US. Unfortunately, many businesses lack real-time visibility into the temperature and humidity status of goods in transit, and environmental condition changes that can result in damaged cargo, wastage and compliance fines. SafeTemps by Digi Smart Solutions is an end-to-end temperature reporting and FSMA compliance solution that provides businesses with real-time visibility into status of the entire food chain from warehouse to transit to delivery, and serves as an independent audit of refrigeration systems. Easy-to-use hardware is shipped ready to communicate; simply attach the gateway box to the exterior of the trailer or truck and install the wireless sensors wherever you need to manage temperature. The sensors monitor and continually transmit temperature data independent of the make or model of the refrigeration unit. With SafeTemps’ GPS tracking and nested geo-fencing, you can track a trailer or truck and receive custom notifications when the vehicle arrives or departs a specified area. Data transmission automatically adjusts to take advantage of available Bluetooth, Wi-Fi or LTE/3G cellular networks while product temperature and journey reports are automatically produced and accessible anytime, anywhere through the Digi SafeTemps dashboard. Maintain product quality and safety and improve operational with SafeTemps by Digi Smart Solutions.